A really cool color switch for this normally bright orange species. 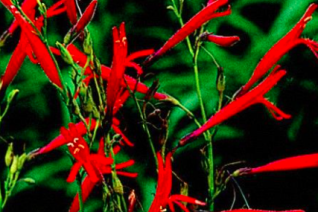 The dusty red tubular flowers rise taller on this cultivar than others to 18″ and it forms a less dense clump of pine leaved low evergreen foliage. Found and named by David Salman of High Country Gardens we’ve found this to be an excellent performer in our climate. Full sun and enriched, well drained soil with light consistent summer water. The flower appear for weeks from May to July. 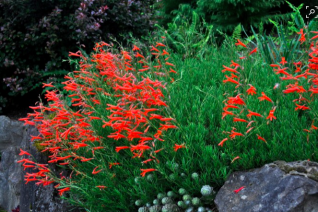 Very forgiving perennial that thrives in rock gardens or dry slopes. Long lived. Hummingbirds. 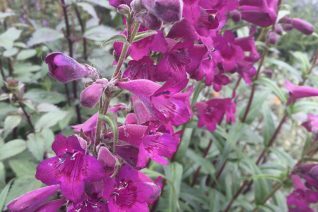 Stellar border Penstemon with several qualities that rises above the rest. To 30″ tall forming multiple spikes of deep purple tubular flowers. The flowers appear continuously if spent spikes are removed. Glossy deep green foliage is disease resistant, and for a border type it is exceptionally hardy to cold. Forms a bloomy, long lived perennial for flower borders or hillsides or meadows in full sun to light shade. Light, regular summer water in rich, well drained soil. Cut back hard in early spring. Blooms continuously until frost and beyond. 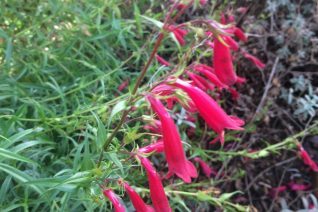 Native to Mexico its a shock that this large everblooming Penstemon thrives in our climate. Multiple bushy spikes support 1/2″ wine red tubular flowers- en masse. It remains in bloom from early June to frost- never quite knowing when to quit. To 2′ x 2′ making a semi-woody framework. Full sun and well drained soil with light, consistent summer irrigation. Remove spent flower spikes and they will quickly be replaced. Loved by hummingbirds. Cut back hard in early spring. 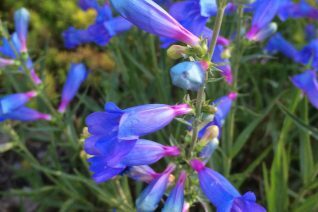 An easy to cultivate blue flowered Penstemon that is a scintillating color and is incredibly showy for the 4-6 weeks it remains in bloom. Flowers begin in May and slack off with really hot weather. 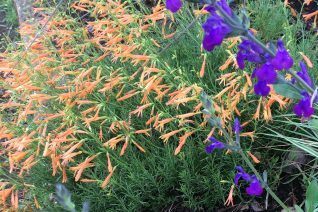 A semi-woody perennial native to the baking hot Sierra Nevada foothills of California. Full sun and fast draining soil with light summer water. Excellent performance in blazing hot hell strips. To 14″ tall and as wide. Cut back hard in early spring. Mulch annually with compost. Provide good air circulation. 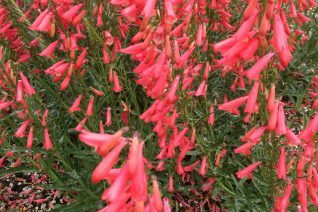 Immensely showy and easy to grow Penstemon with many 2′ spikes lined in bright coral tubular flowers. Blooms May to July from a basal rosette of deep green foliage. Full sun and well drained, enriched soil. Add a layer of compost yearly to spur vigor. Good air circulation. Remove spent flowers and often more will appear. Light consistent summer water.